WINTHROP — Joan Woods is finally getting some relief. In her Winthrop living room, she is silent in her pink, comfy chair. Just moments before, Daria Casinelli, a licensed acupuncturist, inserted 14 needles in Woods’ wrists, feet, and ears to help reduce the pain she feels in her feet and stomach, and to allow the 80-year-old former nurse to breathe easier. After a few minutes, Woods opens her eyes, smiles, and sighs. “It’s hard to explain what peace this gives me,’’ she says. For the last four years, Woods has battled cancer with chemotherapy, radiation, and surgery. A few months ago, doctors told her that the cancer had spread to her lungs. That’s when she decided to stop traditional treatment and enter hospice. In March, the doctors gave her six months to live, so she contacted All Care Hospice, based in Lynn. 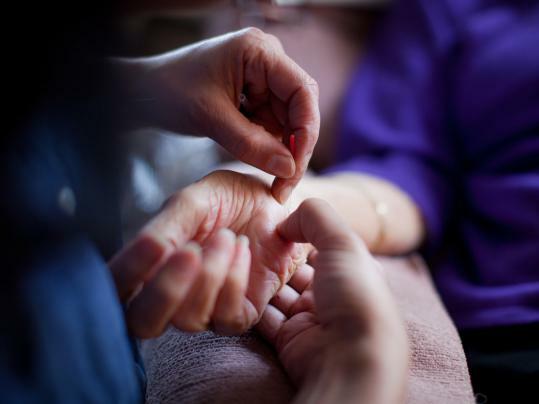 After explaining her symptoms and diagnosis, the hospice asked if she would be interested in a new program offering treatment from licensed acupuncturists associated with New England School of Acupuncture in Newton. Woods, who does not like to take pain medication, had previously seen an acupuncturist to treat her migraines and herniated discs, and remembered the experience as pleasant and calming. “When it was offered to me, I jumped at the chance,’’ she says. The program — which marks the first time a Massachusetts hospice has offered acupuncture to patients — began in April, after Dr. Lewis Hays, All Care’s medical director, met with officials from the acupuncture school. As part of its postgraduate program, the school agreed to recruit working acupuncturists to treat hospice patients. Both organizations agreed that the free program had mutual benefits: The acupuncturists earn postgraduate credits working with patients they normally don’t see, and the patients are exposed to a treatment that doesn’t require drugs and can often bring immediate, temporary relief. “It’s an idea whose time has come, absolutely,’’ says Hays, who believes that acupuncture is effective in treating symptoms that many in hospice face, such as pain, shortness of breath, anxiety, nausea, and vomiting. While acupuncture has been used for thousands of years in China and neighboring countries to treat pain and other symptoms, it is considered a complementary treatment in the United States, is rarely used in hospitals, and is not covered by most health insurance plans. For acupuncturists like Casinelli, the program already has been a learning experience. In addition to treating hospice patients weekly, she also is part of an interdisciplinary team — including a doctor, nurse, social worker, chaplain, and home health aide — that discusses how to best care for the patient. Casinelli, who has a private clinic in Milton and has worked as an acupuncturist for eight years, is treating a group of people she says she would ordinarily not see. “My clientele tends to be very health-conscious,’’ she says, noting that most of the people who walk into her office do not have serious medical problems. In the last two months, she has treated four hospice clients a week. They have a range of symptoms that she had yet to treat, including dementia. “I don’t [usually] see people who are dying, and now I know I can help someone who is really, really sick, and that’s rewarding. As a clinician, that’s the reason you do it — to help people,’’ she says. According to Hays, the national median stay in hospice is about 22 days. Hospice is covered by Medicare, Medicaid, and private insurance. At present, the New England School of Acupuncture is providing four acupuncturists to All Care for 90-day rotations. It takes just a few minutes for Casinelli to treat Woods. The process calls for checking Woods’ pulse to evaluate the condition of her internal organs and then deciding where the disposable needles should be placed. On this day, she inserts two needles in Woods’ wrists, two in her feet, and five in each ear. Woods closes her eyes, and Casinelli lights a charcoal mugwort stick and holds it near Woods’ feet and ears to relieve pain. She then covers Woods with a Mylar blanket and turns the cable channel to a classical music station. For most of the next half hour, Woods is still. When she awakes, Casinelli reaches for her wrist. “The pulse is better,’’ says Casinelli. Steven A. Rosenberg can be reached at srosenberg@globe.com.